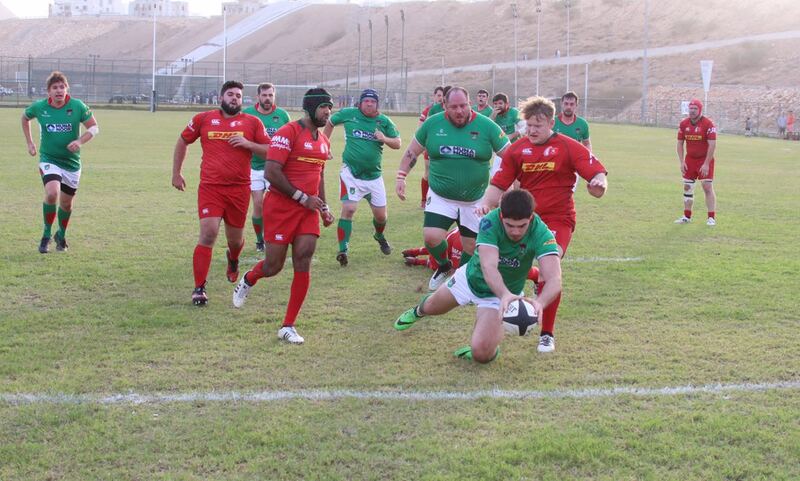 Yesterday afternoon at the Muscat rugby pitch in Bowsher in nearly perfect playing conditions the still undefeated Muscat RFC prepared to face Bahrain for the toughest match they've had so far this season. Muscat have not been able to defeat Bahrain at the Mens level in a very long time, over a decade, and so there was an extra determination to win from the team yesterday. The game kicked off and the teams were well matched with lots of extended phases of play. There was an early penalty which gave Muscat an attacking line out deep in Bahrains 22 which unfortunately was well defended. After 15 minutes of consistent pressure Muscat's Joey Maniel crashed over the line to take the lead 5-0. Bahrains gifted kicker kept them in touch with 2 penalties and the half ended with Bahrain leading Muscat 6 to 5. At half time, Muscat's coaches Steve Hoolohan and Lee Davies gave advice and changed the game plan. This was clearly evident in the second half with Muscat's back line moving the ball through the hands and applying more pressure on Bahrain. 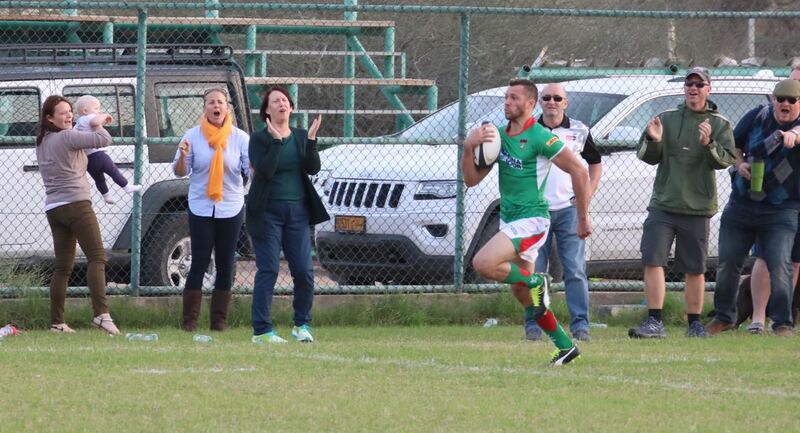 This eventually was rewarded with Zak Harper diving across the try line to take Muscat back into the lead 10-6. Choco Dejean converted to take the score to 12-6. 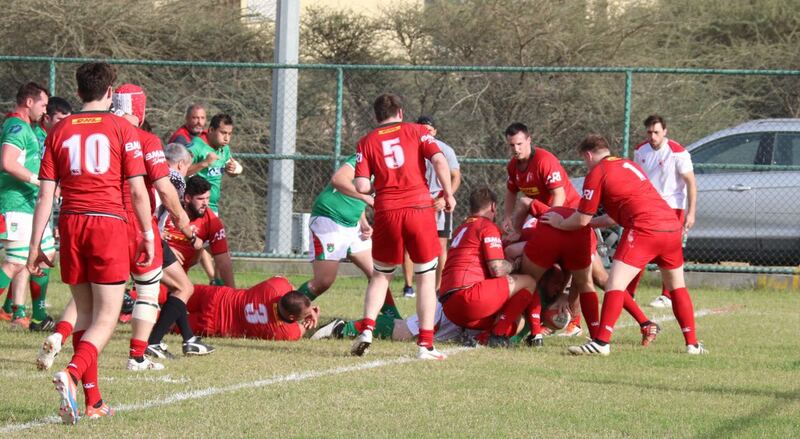 Bahrain responded with a try and a penalty and the score was 14-12 with Bahrain in the lead with 20 minutes to go. MRFC got a penalty which was taken quickly by Choco for 3 points, this was followed by Muscat's back line driving crash balls from its forwards repeatedly into the Bahrain defense, this paid dividends as Muscats fly half Choco broke through for a try, which he converted. There was 10 minutes to go and the score was now 22-14. Bahrain countered with a long penalty to close the gap to 22-17. After some exceptionally fast passing from the two centres, Alex Maxton and Dillan Karelse, the team was rewarded with Muscat's fourth try from its fast winger, Scott Jardine out pacing everyone on the field, again Choco kicked the conversion and the score was now 29-17 with the ref saying the game needed to be restarted before the end of time. 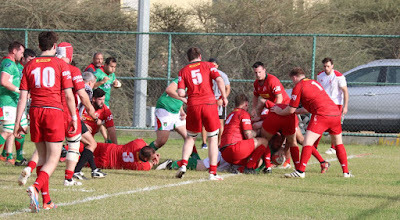 Through some luck Bahrain managed to score a try to make the final score 29-22. Muscat's 4 tries netted it a bonus point and Choco Dejean was named Man of the Match. 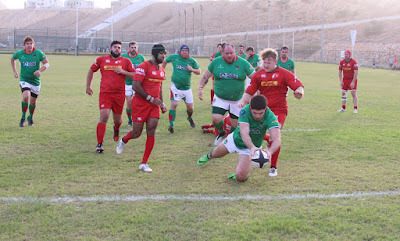 Muscat RFC relies heavily on its sponsors, if it wasn't for Muna Noor, Hamptons, The Grand Hyatt and Engie STOMO they would not be able to continue playing rugby. Muscat are now looking forward to next Friday where they will face Doha also here in Muscat - if they can achieve a victory in that game, Muscat will have won the league as no other team would be able to catch them.